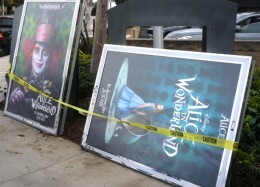 Fuel Outdoor, the rogue sign company that failed to win a lawsuit challenging the city’s right to ban new off-site advertising signs, has begun taking down the movie-poster style signs installed without permits in a number of locations. Whether the New York-based company intends to remove all its estimated 200-plus signs is not known. Signs being removed on Overland Ave. The sign removal follows a guerrilla action by a group called “Renegade Sign Bandits” which posted official-looking “Illegal Sign” notices on a large number of signs in Venice, West L.A., and the San Fernando Valley. However, a more likely cause of the sudden action by Fuel Outdoor is the City Attorney’s newly-aggressive move against companies posting illegal signs, including a massive lawsuit filed against 27 persons and companies two weeks ago, and last week’s jailing of a man for allowing an unpermitted supergraphic sign on his Hollywood building. A major question about the Fuel Outdoor signs has yet to be answered: Will the company be allowed to walk away with the millions in revenue it garnered from the signs, some of which have been up for as long as five years? Fuel Outdoor also has signs in San Francisco, New York, and other major cities. Several weeks ago, crews were seen in New York taking down the company’s signs there.